(Nanowerk News) It’s a well-known phenomenon in electronics: Shining light on a semiconductor, such as the silicon used in computer chips and solar cells, will make it more conductive. But now researchers have discovered that in a special semiconductor, light can have the opposite effect, making the material less conductive instead. 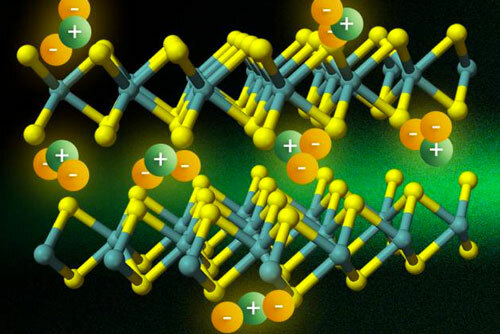 The phenomenon was discovered in an exotic two-dimensional semiconductor — a single layer of molybdenum disulfide (MoS2) just three atoms thick. The finding is reported in a paper in Physical Review Letters ("Trion induced negative photoconductivity in monolayer MoS2") by MIT postdoc Joshua Lui; Nuh Gedik, the Lawrence C. and Sarah W. Biedenharn Career Development Associate Professor of Physics; and six others at MIT, Harvard University, and in Taiwan. The researchers found that when illuminated by intense laser pulses, single-layer MoS2 is reduced to approximately one-third of its initial conductivity. The team used optical laser pulses to generate the effect and time-delayed terahertz pulses to detect the conductive response of the material. When a semiconductor is illuminated by light, its conductivity tends to increase. This is because light absorption generates pairs of loose electrons and holes — places in a material with “missing” electrons — that facilitate the flow of electrical current through the material. This phenomenon has been the basis for designing and optimizing optoelectronic devices such as solar cells, digital cameras, and other light detectors. The strong electrostatic interactions give rise to an interesting effect: When light generates an electron-hole pair in the material, instead of flying off freely as they would in a three-dimensional solid, they remain bound together. Such a bound state is called an exciton. In fact, the interactions in single-layer MoS2 are so strong that excitons can capture extra free electrons in the material and form bound states with two electrons and one hole. In single-layer MoS2, trions have the same net charge as an electron, but a mass roughly three times that of an electron. “Their much heavier mass dulls their response to the electric field, and lowers the material’s conductivity,” Lui says. Instead of increasing the population of free charges, the illumination actually converts the original free electrons into heavier trions with the same charge density. This is the reason for the reduction of conductivity of single-layer MoS2 under illumination. Gedik says that the work “might help us to realize room-temperature excitonic devices,” which would otherwise require extremely low temperatures. In addition, because the effect can be switched on and off using light pulses, such devices could be easy to control without wired connections. So far, the team has only studied the effect in MoS2, which belongs to a family of new two-dimensional semiconductors. “There are other types of two-dimensional materials with [similarly] strong trionic effect.” Lui says. “They are likely to exhibit the same photoconduction phenomenon”.